Vocal Scores for Handel's Coronation Anthems. The four anthems Handel composed for the coronation of King George II and Queen Caroline on 11 October 1727. The two most popular vocal scores for Handel's Coronation Anthems are shown below. Full video version to hear the work in full is also shown below. 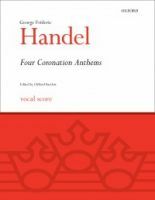 The Novello edition of Handel's Coronation Anthems is in English and is edited by Cranmer and Burrows for SATB. One of the lasts acts of King George I before his death in 1727 was to sign "An Act for the naturalizing of George Frideric Handel and others." Handel's first commission as a naturalized British citizen was to write the music for the coronation later that year. The four anthems Handel composed for the coronation of King George II and Queen Caroline on 11 October 1727 have never lacked popular favour. They were repeatedly performed at concerts and festivals during his life and since, and he incorporated substantial parts of them, with little change except to the words, in several oratorios, notably  Esther and Deborah. (Incidentally, two of them were performed at the opening concert of Oxford's Holywell Music Room in 1748). Their success may have contributed to the popular image of Handel as a grandiloquent composer demanding huge forces of voices and instruments - the more the better - the figure stigmatised by Berlioz as a barrel of pork and beer! In fact Handel always matched his music to the occasion and the building for which it was written, and no occasion could be grander than a coronation. His ceremonial style in these anthems differs from his music for theatre in much the same way as the Fireworks Music, designed for performance outdoors, differs from the instrumental concerti. It is wholly extroverted in tone, dealing in masses and broad contrasts rather than delicate colour: he was not going to waste finer points of detail on the reverberant spaces of The Abbey. The forces that he used were substantial for the period: an augmented Chapel Royal Choir of 47 and an orchestra that may have numbered as many as 160! The chorus is divided from time to time into 6 or 7 parts (the tenors remain united) and a large body of strings includes three (not the usual two) violin parts. Zadok the Priest (with words adapted from the first chapter of the First Book of Kings) opens with a tour de force that no degree of familiarity can stale. The long ritornello, based on rising violin arpeggios over richly spaced repeated chords for lower strings and woodwind, prepares the way for a resplendent climax at the entry of the voices in 7 parts together with the trumpets and drums. Handel specifies no tempo and no dynamics except soft at the start and loud at the chorus entry; but the music implies a long sustained crescendo that conveys an overwhelming sense of expectation and suspense. The anthem is in three sections with the chorus for the most part moving homophonically to present the text clearly: there is scarcely any counterpoint. There is little harmonic surprise and the piece is firmly rooted in the tonic D major (the key dictated by the old valveless trumpets): thus Zadok is a supreme example of Handel's power to make a unique statement by the simplest means. The words of Zadok the Priest have been sung at every coronation since that of King Edgar in 973AD, and Handel's setting has been sung at every one since 1727. The King Shall Rejoice uses a text from Psalm 21 and Handel sets each of the four sentences and the final Allelujah as separate musical sections. The first movement, full of festive pomp and glittering fanfares with a long introductory ritornello, exercises the full strength of the choir and orchestra. The second movement, with no trumpets or drums, is in a lilting triple time, and it features the higher and lower string sections in playful exchange and also a catchy rising triplet figure in thirds. The choir enters in just 4 parts (exceeding glad) and then enjoys long chains of suspensions on of thy salvation. The brief outburst of the triumphant third movement, with its extraordinary harmonic surprise, links directly to the fourth. This movement is again in triple time but it has more fugal counterpoint and Handel builds the excitement by adding instruments as he goes: first the strings, then the oboes and finally the trumpets and drums. The final movement is an exuberant double fugue (a fugue with two simultaneous melodies pitted against each other from the outset) which gives the piece a magnificently grand and elaborate conclusion which, as it was performed at the actual crowning section of the coronation service, matches the occasion perfectly. My Heart is Inditing is an adapted and abridged text using verses from Psalms 45 and Isaiah 49, and is a coronation text that Purcell had set for the service in 1685. In 1727 it was sung late in the service when Queen Caroline was crowned, and throughout Handel's setting are references in the words that are relevant to a queen. The music is characterised by a more refined and genteel air than the other anthems, and this would have been appropriate for the queen's coronation too. The opening of the first movement, rather than a blazing trumpet fanfare, is a triple time Andante and the first section is taken by the soloists (originally 2 singers on each part to balance with the large orchestra) before the full choir enters. The second section, again an elegant Andante, features a charming walking bass line in the orchestra, and the melody begins with a long note followed by a jaunty dotted rhythm, matching the words Kings' daughters. The third movement is yet again an Andante that maintains the air of grace and femininity until the laughing dotted rhythm appears on the words and the King shall have pleasure. Handel saves his Allegro until last, and the orchestra begins the final movement with a dazzling virtuoso ritornello before the choirs enters with all the ceremonial pomp of the other anthems. Handel keeps his trumpets in reserve until the very last when they add another triumphant dimension to the finale.